Travelers always ask about the best places to enjoy a great meal in cities across Italy. In Florence, my list of those still owned by the same family for more than three generations is very short. There are plenty of other great restaurants in the city, yet these three are special. Many families who have worked for generations are beginning to sell out under pressures of the economy. These will, I believe, continue to contribute their small share of making true Tuscany remain true. If you do visit Florence, these are three you should be certain not to miss. I continue to take every opportunity to enjoy meals at these wonderful places! 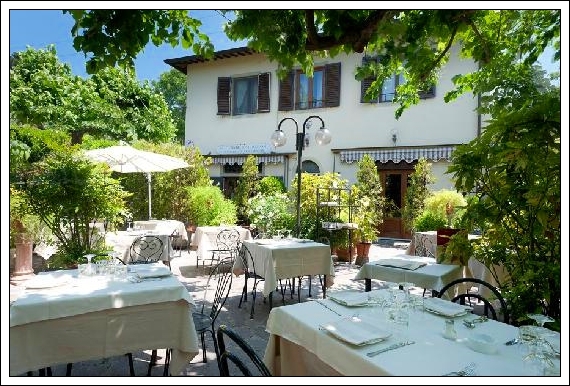 Five generations ago, Signore Baudone established the Trattoria da Bibe (in honor of his wife, whose nickname was Bibe) along a small stream in the village of Galuzzo just outside of the ancient Roman gate of Florence. Since then, the family has dedicated themselves to a tradition of fabulous food, well prepared, fairly priced and presented with excellent service. Tables on the garden terrace – left – are wonderful in season and the homey interior is reminiscent of many family villas across Tuscany. Tucked into a small corner on a little walked street directly behind the Palazzo Vecchio, this place is one of the best places for lunch in the city. The staff is energetic, the food is fabulous and very very affordable (lunch of three courses is often less than 11 Euros!) and the location makes it a perfect stopping place between the Palazzo Vecchio, Piazza della Signoria and the wonders of Santa Croce’s neighborhood. GO! For all the details about my favorite restaurant in Florence, please click on the link below to my March 2012 article about this fabulous, family owned and operated restaurant near Piazza San Marco and the Accademia in Florence. For an unforgettable meal in a lovely, simply atmosphere with great food and service – and very fair prices – enjoy.